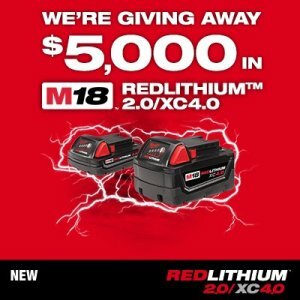 Milwaukee is currently running a giveaway on their Facebook page where you can win a pair of their Redlithium batteries. 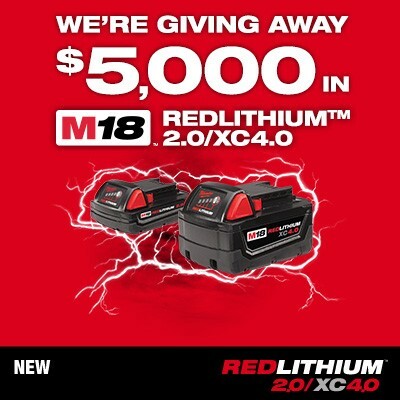 They will be giving away a grand total of $5000 worth of batteries that will go to a number of lucky winners. And because we are awesome, Milwaukee has also given Tool-Rank readers a second chance at winning a set. Each winner will receive one of their M18 2.0Ah batteries and one of the new XC4.0Ah batteries. That's right, you get a pair of new batteries with longer runtimes to make your job that much easier. Sign up for the Tool-Rank monthly newsletter. If you have already signed up you are already entered to win. It pays to be a loyal Tool-Rank reader.